ICfL considers the creation and enlargement of library districts to be the cornerstone of public library development in Idaho. Why are library districts so important? The creation of library districts is the only way in which all Idahoans can receive public library service. One of ICfL’s goals is that All Idahoans will have local access to library services. As of 2017, 17.4% of Idahoans did not live within a legally established library service area. Most of these people live outside of incorporated areas or in communities so small that they could not provide adequate public library services by themselves. According to Idaho code, the only way that residents living outside of incorporated areas can receive tax-supported public library services is to reside within a library district. Thus, in order for these people to receive public library services, library districts will need to be created. The creation of library districts is the only way of providing adequate support for public library services in many parts of Idaho. Even where public libraries do exist, some are so small that they cannot adequately meet the ever-increasing information needs of their communities. As STEM learning, maker facilities, and digital content continue to increase in importance, public libraries operating on very small tax bases simply cannot keep up. Recognizing this, the State Legislature established statutory minimum limits for new library districts. New districts must serve a minimum population of 1,501 and have a market value for assessment purposes adequate to raise a minimum of $25,000 in tax revenue. [See section 33-2703, Idaho Code.] In 2017, of the 103 existing public library entities, however, 28 served a population of less than 1,501, and 13 libraries received less than $25,000 in local tax revenue. The creation of larger library districts can save taxpayers money. Economies of scale are important in getting the most from each taxpayer dollar. The creation of larger units of service can decrease administrative costs and provide larger potential discounts for the purchase of library materials. The combination of several smaller districts into a larger district can save legal costs, costs for bonding a treasurer, and many other costs which each district has to pay. In addition, through centralized purchasing the new district may get larger discounts from vendors because of its increased buying power. Library districts provide a form of governance that helps assure a continuity of funding and services. City libraries often face difficulties because they are in competition with other city departments for city tax dollars. Typically, when tax revenues are low, city councils may sacrifice funding for the library in order to fund “essential services” such as the police, the fire department, and streets. In addition, there is often confusion between the role of the city council and the library board in the running of the library. It is not uncommon for city councils to believe that they have the right to control library expenditures and have the right to make personnel decisions about the library director in spite of the fact that these powers are granted statutorily to the city library board. This confusion about the roles of the city council and library board can lead to conflicts that can have a detrimental effect on library services. 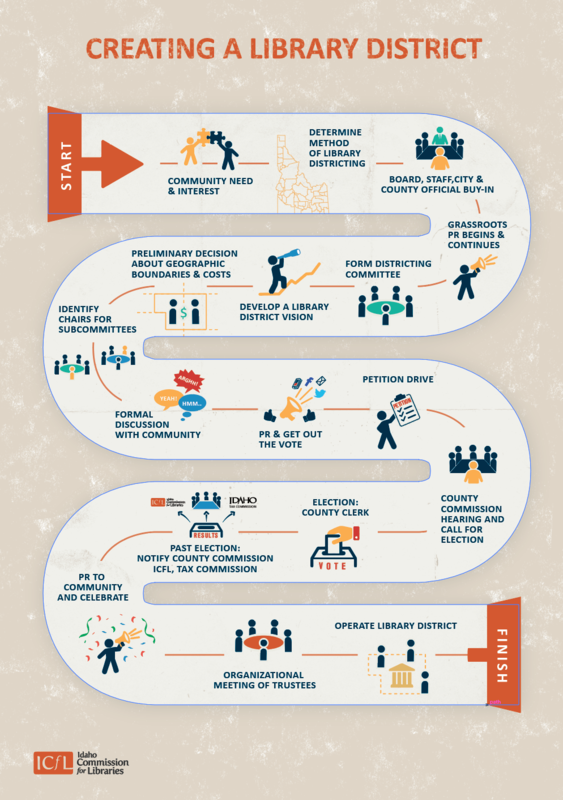 Because of these issues, the Idaho Commission for Libraries maintains that the ideal governance structure for Idaho libraries is autonomous library taxing districts having a population-financial base to provide excellent local service and participating as responsible members of the state’s resource-sharing network. There are nine tasks that need to be completed during the Assessment Phase of a library districting process. Task Number One is to determine whether there is a perceived need for a library district through informal conversations with members of the community. Task Number Two is to form an exploratory group of supporters to plan and carry out the Assessment Phase. Task Number Three is to create a written vision statement of what a library district could provide. Task Number Four is to assess potential costs for the district. Task Number Five is to make formal presentations about library districting to community organizations. Task Number Six is to identify and contact potential supporters of a library districting effort. Task Number Seven is to identify potential opponents of a library district. Task Number Eight is to task a formal committee with pursuing the library districting process. Task Number Nine is to make preliminary decisions about what geographical area will be covered by the library district, and about how the district will relate to any existing public library entities within or near this area. The Planning Phase is a time of preparation. During this phase, you will not only decide what your library district will look like, but you will gather information that will allow the district to be created in a smooth and orderly way. Some of this information will be used only after the district has been created or expanded, but knowing what needs to be done and having plans in advance will make the hectic first few months of a new district’s life much easier for everyone involved. The working group’s efforts in the Planning Phase, in other words, will culminate in the official actions of the new district’s library board during the first few weeks after the successful election. First, the working group must ‘plan to plan’. In other words, they must decide how they will do the planning necessary to create and operate a new district. Second, the working group must plan how it will carry out public relations to build support for the districting effort. Third, the working group will need to coordinate its efforts with local government officials who will have responsibilities in creating the new district. Fourth, the working group must plan the library services that will be offered by the new or enlarged district. Fifth, the working group will need to begin planning for the administrative structure (board structure and bylaws, operational policies, etc.) of the new district. Sixth, the working group will need to recommend personnel policies for the new district. Seventh, the working group will need to plan for library facilities for the new district. Eighth, the working group will need to make an accurate estimate of first-year and long-range costs for the new district, and in particular how the district will handle the cost of its first year of operations. Ninth, the working group will need to make final decisions about the geographic area that will be included in the new district. Tenth, the group will need to go through the legal steps to create the district. These activities will be discussed in the next chapter.